Lessons on the dangers of loan sharks are being launched in our schools. 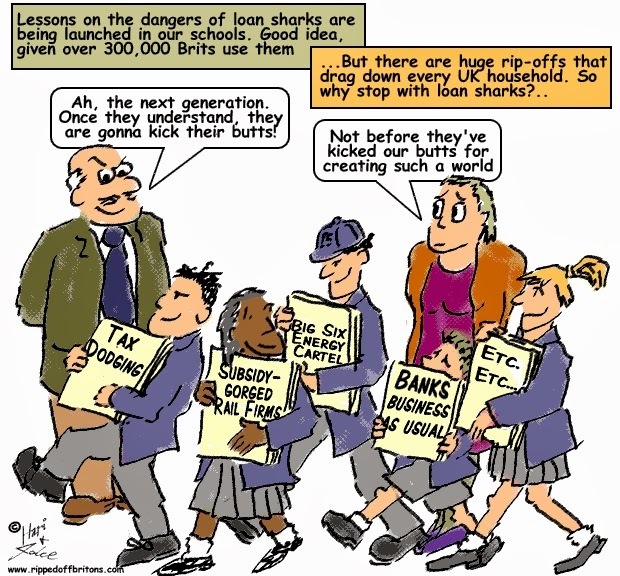 Why stop with loan sharks? The Illegal Money Lending Team (ILMT) in England is offering schools ready-made lessons designed to warn their pupils about the danger. The educational packs, which include videos, have been funded by confiscated money from convicted loan sharks. More than 2,500 primary and secondary schools have already expressed an interest. It is estimated that 310,000 families use loan sharks, typically borrowing £350 at a time. But as the debts escalate to thousands of pounds, it is thought borrowers are paying £700 million a year to unlicensed lenders. Government wants you to think we made a profit on sale of Lloyds Bank shares. Actually we made a thumping loss!